Remember Phillip of the beautiful logo? There is only one problem: Florence’s wheels are at least 26 inches – if not 27. Oh the quandry! Dilemma even! 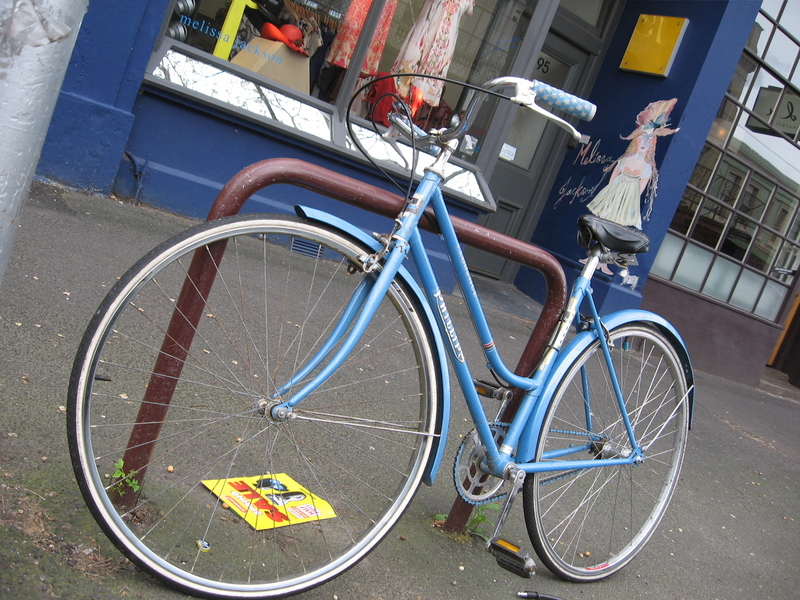 If I started blogging every gorgeous big wheeled retro bike I saw in Fitzroy, not only would I have to give up my day job to make the time to do it, but I would have drop ‘little’ from my blog name – ‘bikeblog’ just doesn’t have the same ring! Oh bugger it. Florence is gorgeous and she needs sharing. Was lovely to meet you on the street and I’m stoked you’re sharing my florence with the online world! Indeed, how could I have omitted to mention the grouse number-plate? I wish I’d snapped it. Keep on riding lady! My bike got stolen from outside work yesterday If you see her let me know! bastards! Will keep my eyes out. | Little Bike Blog <Liked it! and sadly, that bike got stolen not long after that. The rider was devastated. Hi Loz, yes it’s a beautiful bike isn’t it. Sadly it was stolen some time after the post. 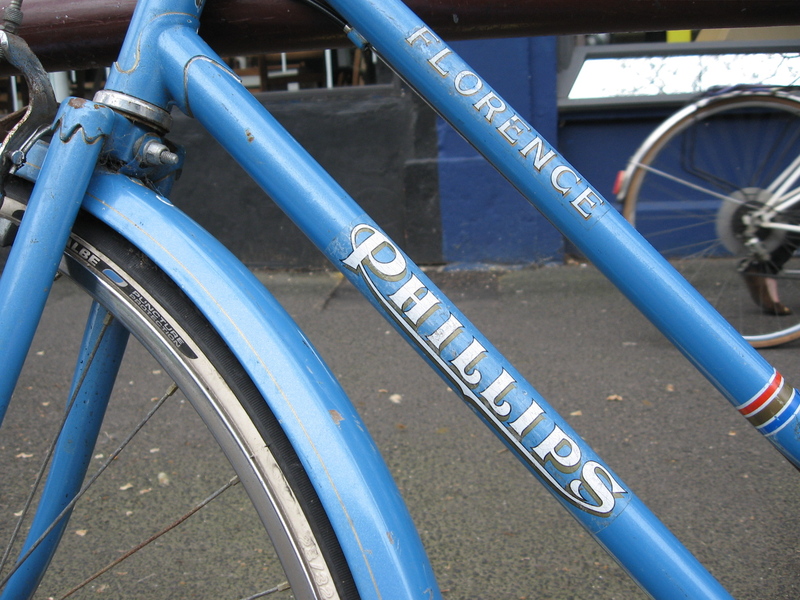 You might notice it’s quite an old post, and I don’t think the owner is a follower of this blog, so your quest for more information on Phillips might have to go in another direction. Thanks for visiting little bike blog. BIkey Face Illustrated adventures of a plain clothes cyclist. CERES Bike Shed You too can make your own little bike from recycled bits and pieces (if you live in Melbourne). 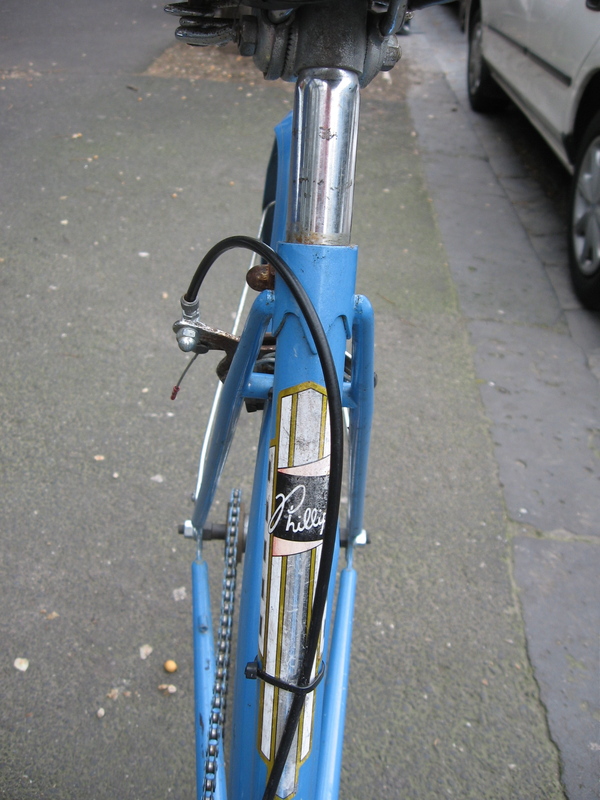 Dave's Vintage bicycles Bookmarked to a little ripper folder, this site has everything you need to know about vintage bikes, and possibly some things you don’t need to know. Folding Cyclists A site dedicated to folding bikes – this links to their photo gallery which has some delicious retro folders, and at least one exquisite contemporary one called Rad Concept. My NS22 One man’s journey into restoring a NS22 Peugot (folder). This guy really has the folding Peugoet bug; if you want to know how many spokes it has, this is your site. Small Wheeled Bikes by Tony Hadland (UK) A feast of articles about small wheeled bikes that includes a brief yet strangely comprehensive history of the Raleigh Twenty, in all its incarnations, including the Stowaway. The Raleigh Twenty An absolute must site for any one who rides or admires the Raleigh Twenty. You’ll be pleasantly surprised how many of you there are out there. Vetti live in Northcote Nothing to do with bikes: everything to do with seeing the gorgeous things around us, she has a keen eye, especially for little street art gems and serendipidous bits of beauty in the ordinary. Have a squizz: you won’t regret it.